Some cool new stuff going on at PTF on the Cobb AccessTuner front…We have had the awesome privilege of working with the guys at Cobb. Obviously the BMW DME gurus at Cobb are the ones doing all the heavy lifting in the DME. On our end we’re calibrating and providing feedback in the R&D lifecycle from the ATP calibrator/tuner point of view by testing it on the dyno, street and track along with pro tuning services we started recently. First thing, OTS V402 Alpha maps. Still not for public consumption but should be available in Beta form to those interested in trying them out very soon. Most important feature in v402 is changes that dial out boost oscillations a few of you have experienced and reported in your rides. We will be using V402 maps as our base maps for all of our custom pro tunes going forward. Second, alternative fuels research & development. This one is my personal favourite Alternative fuels (such as E85 and especially meth) are hard to ignore on this or any FI platform today and work is being done on that front to extend the support in tuning that AccessTuner software provides when it comes to properly calibrating these fuels to work on the N54 platform (e.g. mixture codes, etc. that some of you reported). There is no ETA on this work but things are looking very promising! Last but not least, PTF has gotten quite a few requests for custom pro tunes from road course enthusiasts and quite often we keep hearing, even with twin oil coolers, they are limping at the track and are looking for further cooling features, in this case software. 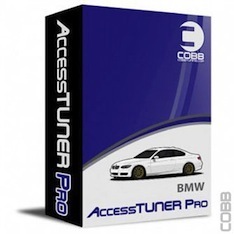 Cobb’s working on adding cooling system calibration capabilities into AccessTuner software that should add additional calibration ability for those pushing their cars at the road courses. Details of this are still in the works but its in the pipe and its pretty exciting. Any questions or help related to tuning with your current ATR, reviewing datalogs, etc. let us know and we’ll do our best to help both locally and on the BMW forums.